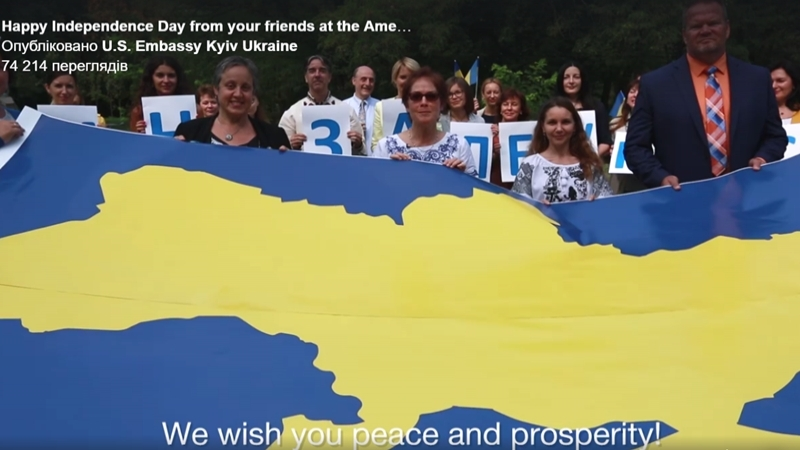 Staff of the US Embassy in Ukraine congratulated Ukrainians on Independence Day with a music video. The staff of the US Embassy in Ukraine published celebratory video, timed to the Independence Day of Ukraine, on Twitter, Facebook and Youtube. “On behalf of the American people, Ambassador Marie Yovanovitch, and the staff at the US Embassy in Kyiv we wish all Ukrainians a joyous Independence Day holiday,” writes the message in the social network. The embassy staff in Ukrainian embroidered national shirts and with Ukrainian flags perform a song of the rock group Numer 482 "Good Morning, Ukraine! ", Which plays against the background. At the end of the video, Ambassador Marie Yovanovitch addressed the citizens with congratulations in Ukrainian. “Best wishes from American friends. Peace and prosperity to you," she noted.